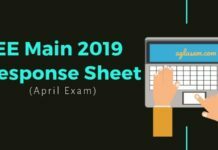 JEE Main 2019 Analysis – Here you can check JEE Main 2019 Paper Analysis for 7, 8, 9, 10, and 12 April 2019. As per the students, the JEE Main 2019 April is easier than the Jan exam. The most difficult section, for most of the students, is Physics and easiest is Chemistry. Mathematics is moderate in level of difficulty and was a bit lengthy. Nothing was out of syllabus throughout and questions from class 11 had more weightage in the exam. 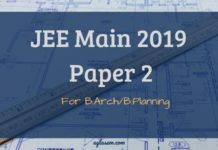 Check more details on JEE Main 2019 Paper Analysis from this page. Get JEE Main 2019 Exam Analysis for April 7, 8, 9, 10, and 12, 2019, from the links below. JEE Main 07 Apr 2019 Check Here – Available! Check Here – Available! JEE Main 08 Apr 2019 Check Here – Available! Check Here – Available! JEE Main 09 Apr 2019 Check Here – Available! Check Here – Available! JEE Main 10 Apri 2019 Check Here– Available! Check Here– Available! JEE Main 12 Apr 2019 Check Here– Available! Check Here– Available! Appeared for JEE Main 07 April 2019? Tell us questions that you remember and we will try to provide answers — Click Here to submit questions. The team of Aglasem presents you live student reaction and student analysis the centre. Here, you can read JEE Main 2019 Paper Analysis of all the days in short. Both the shifts on the last day of JEE Main 2019 April session was moderate in difficulty level. From physics being the toughest section to mathematics being a bit lengthy. Chemistry has been easy to solve throughout the session. There were topics in every section that was frequent in all shifts such as mechanics, optics in physics. coordinate geometry, trigonometry, probability in mathematics. However, topics in chemistry were equally distributed. The examination on April 10th 2019 was of moderate difficulty level. Physics was the toughest section in both the shifts again. Mathematics in the first shift was found to be difficult however, in the 2nd shift Mathematics was comparatively easy. Chemistry was easiest throughout the session to date. The difficulty level of the exam today was very similar to that of the January session. Both the shifts for JEE Main 2019 was found to be of a moderate level. Candiadtes from the first shift found the physics section toughest while in the second shift Mathematics was the toughest. Chemistry, however, was the easiest of all. In the physics section, more questions were fro CBSE Class 11th and were found to be difficult. Chemistry in both the shifts had equal weightage of organic, inorganic and Physical. Mathematics had questions from Trigonometry, Coordinate geometry and Parabola. 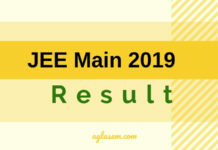 The paper 1 of JEE Main that is for B.Tech and B.E ha now started from April 08, 2019 and as per the students who took the first session of the exam, it was easy as compared to the January session. The physics section was the toughest of all three sections. Furthermore, the mathematics section of paper 1 was easy for most of the students but some reported it to be taught which makes the paper overall moderate. Chemistry, as usual, was the easiest, although student found the chemistry paper of January session easier. JEE Main2019 had started yesterday that is from the 7th of April 2019. The examination is conducted in 2 shifts each day from April 7 to 12 2019. As the paper for B.Arch/B. Plan has now been conducted in two shifts on one day for all registered candidates. Overall the paper 2 of JEE Main April session was moderate with aptitude section being the easiest of all three. The students further added that the drawing section was the most time talking and that mathematics section was the toughest of the three. The April attempt of JEE Main 2019 starts on Sunday i.e. April 07, 2019. The exam is being held over a period of 5 days and there is 2 shift each day. On the very first day, JEE Main 2019 Paper 2 is being held and on the next 4 days, the Paper 1 exam is scheduled. In all, there are 10 shifts in the JEE Main 2019 April exam. The analysis of the exam also includes the student’s initial reactions right after the exam. This helps the students going for all the preceding shifts get an idea of what type of questions are being asked and what difficulty level to expect. In turn, they can grasp a few suggestions and pieces of advice form the students who have already taken the exam. Soon after the exam for each shift is over, coaching centres like Allen, Resonance, Career Point, Aakash, FIITJEE etc come with their expert analysing the JEE Main 2019 Questions. However the exam is being held in the online mode, the analysis is based on memory based questions. However, they are quite helpful. In addition to that, the analysis is accompanied by JEE Main 2019 question paper solutions. 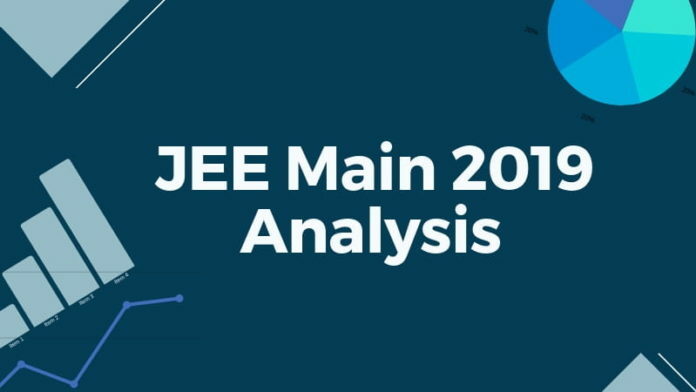 What Does the JEE Main 2019 Analysis For The April Exam Contain? You get to know the trends and changes in the question paper. In addition to that, you get to know about any new concept that had been added in the exam. You get to know the pattern followed in each shift and day. That might help predict the pattern that is to be followed in your shift. The January attempt of JEE Main 2019 was held on January 08, 09, 10, 11 and 12, 2019. The exam was entirely in online mode. Same as the April exam, on the first day the Paper 1 was held and on the rest of the days the Paper 1 was held. Thus, making a total of 10 shifts. The exam was moderately difficult. In most of the shifts, Physics was the most difficult section. Chemistry was on the easier end. There were few new concepts added and some tricky questions were there. many students reported that even if the papers were moderately difficult, they were lengthy. Chemistry – Chemistry have given mixed feedbacks in chemistry. Some said it was easy, some said it was difficult. Mathematics – Comparatively easier from last year. NTA releases the JEE Main 2019 Answer Key, however, just after the exam is over, the memory based answer key is also made available. Since the exam is being held in a complete online mode, the answer keys that are made available after the exam is based on the memory of the candidates. Coaching centres like Resonance, Allen, Career Point etc release the JEE Main 2019 Questions, Answers and their solutions. However, they are all memory based too. The candidates can use them for their reference and get an estimate of their raw scores. This estimate is of the raw scores, however, the result of JEE Main 2019 is based on the percentile scores. Along with the answers the candidates get to know the memory based questions too. The questions that the candidates remember after the exam is over are the memory based questions. NTA also releases the questions and the candidates’ response online within 2 days of the exam is over. However, before that, the candidates can use the memory based questions, their answers and solutions to get an estimated score of the exam and get an idea of how well they have performed. The duration of the JEE Main 2019 is 03 hours and consist of MCQ type questions only. Both Paper 1 and Paper 2 are conducted in online mode by NTA. The question paper is in English, Hindi, and Gujarati language only. The paper 1 exam is of a total of 360 marks and the paper 2 exam contain 390 marks. Paper 2 is of 03 hours duration and it is divided into three parts – Part 1 consist of questions from Mathematics, Part 2 is the aptitude test and Part 3 is the Drawing test. Part 1 and 2 are held online, and Part 3 is conducted in pen-paper mode.